Avocados are the most salt and drought sensitive of our fruit tree crops. They are shallow rooted and are not able to exploit large volumes of soil and therefore are not capable of fully using stored rainfall. On the other hand, the avocado is highly dependent on rainfall for leaching accumulated salts resulting from irrigation water. In years with low rainfall, even well irrigated orchards will show salt damage. During flowering there can be extensive leaf drop due to the competition between flowers and leaves when there is salt/drought stress. In order to reduce leaf damage and retain leaves, an excess amount of water is required to leach salts out of the roots zone. 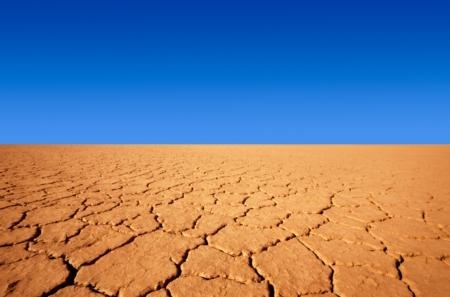 The more salts in the water and the less rainfall, the greater leaching fraction. Drought stress often leads to diseases, such as black streak, bacterial canker, and blight (stem, leaf, and fruit). 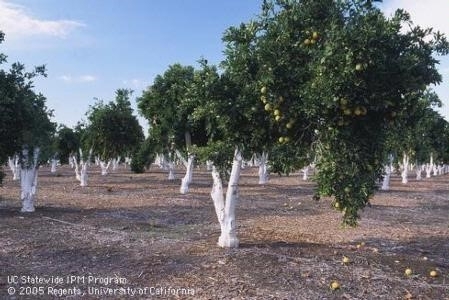 Defoliation leads to sunburned trees and fruit which can be severe economic losses. Ensure that the irrigation system is at its greatest potential and is maintained. Avocados are grown on hillsides and pressure regulation is extremely important and is frequently neglected. Significantly prune trees to reduce leaf area. Avocado can be a very large tree, and if half the canopy is removed, there can be as much as 1/3 reduction in water use. When trees are about 15 feet tall, removing half the canopy can reduce water use by one half. In extreme drought conditions, the canopy can be reduced to just the skeleton branches which are white washed to prevent sunburn. Water use drops to zero, and then gradually as the tree leafs out, water can be slowly reapplied, but at significantly less amounts than with the full canopy. Stumping typically results in three years' worth of crop. In orchards that have low producing areas, because of recurrent frost, high winds, shallow soils, disease, etc. the grower could decide to completely remove those trees, thereby saving water. White kaolin applied to leaves has been shown to reduce leaf temperatures and water loss. This can be used, but under the direction of the packing house, since if it is applied to fruit, it is very difficult to remove. Citrus is much less sensitive to salts and drought than avocado, partially because of its greater rooting depth. However, it is much more sensitive than deciduous fruit trees, resulting in smaller fruit and lower prices when drought cannot be addressed with adequate irrigation water. Drought also makes the trees more susceptible to leaf drop, and sunburned fruit. The strategies for citrus are very similar to those for avocado. It is much more sensitive to pruning to reduce water use than avocado. Typically removing half the canopy results in half the water use. Because of thus greater control, citrus is rarely stumped. By reducing canopy size, production can be maintained, often without loss of fruit size. Kaolin clay can effectively reduced water use and can be applied soon after harvest without the problem of coating fruit making its removal difficult at the packing house.